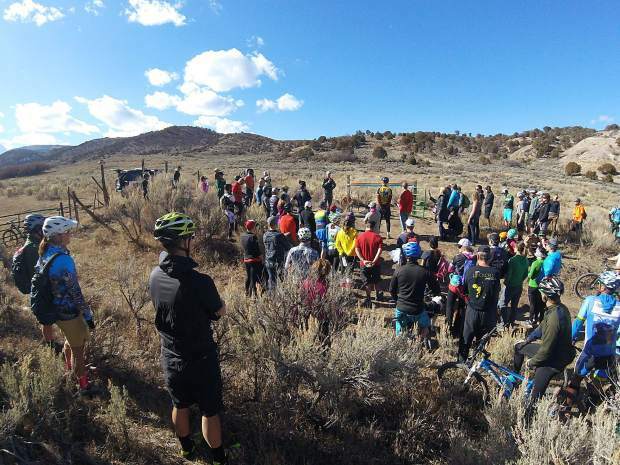 Crowds gather at the start of Eagle’s LOV Connection trail on Saturday, Nov. 11. The event was both a naming ceremony for the new trail and a celebration of life for its namesake, Nate Picklo. When you learn that the entire donation goes to the Hardscrabble Trails Coalition, you’ll probably be even happier to contribute. The Hardscrabble Trails Coalition volunteers have become experts in stretching a dollar. And when it comes to trails, a dollar can take you a long way. Dusty Boot owner John Shipp learned this serendipitously, when he felt compelled to, as he put it, “put my money where my mouth is,” at a trails meeting in Avon in 2014. Shipp offered up $5,000 to see some construction occur in the West Avon Preserve, and a few months later he was hiking on new trails in the town-owned open space there. Right now the Hardscrabble Trails Coalition is charged with overseeing trail maintenance and development in Eagle. Knowing that the coalition was in need of private donations, Shipp started All Trails Start Here with Bonfire Brewing as a funding mechanism for the Hardscrabble Trails Coalition to spur trail construction and maintenance in Eagle. The program started as a collection plate of sorts. Using his restaurant as a base of operations, Shipp invited the community out to eat burgers and sample beers from Bonfire Brewing, with a portion of the sales going toward trails. It was a Monday evening — not typically a busy time — but the place was packed. Shipp was impressed, but not necessarily surprised. “Trails are a hot thing for everybody right now, and I think everybody realized the benefit of trails for the enhancement of the community,” he said. Andy Jessen, with Bonfire Brewing, said he had been wanting to collaborate with the Dusty Boot, and this was the perfect opportunity. Bonfire had been using the tagline that all trails in Eagle end at the brewery, and the name All Trails Meet Here was born. If you purchase a Hardscrabble Mountain Burger at the Dusty Boot, a dollar goes toward trails. Buy a Bonfire beer to go with it, and another 50 cents will go toward trails. Krista Schmidt, operations manager at the Dusty Boot, said the burger quickly became one of the most popular items on the menu. “Once people heard that it was something that could help out trails, people jumped on board,” Schmidt said. Thousands of Hardscrabble Mountain Burgers and Bonfire beers have since been sold, enough to order a wildflower study to see where more trails should, and should not, be constructed in Eagle. “We’ll be on the ground constructing trails next spring, because of that money,” Shipp said. The long-term goal is to put together a reliable and predictable funding source. For now, the money goes to the Hardscrabble Trails Coalition, which has been collaborating with the Bureau of Land Management and the town of Eagle to move things forward. Jeremy Gross with the town of Eagle has helped out on the administrative side, and the Bureau of Land Management has confirmed that once the proper studies have taken place, they will allow another 15 miles of trail construction. One new trail was already able to take shape, the LOV Connection. A tribute to the late mountain biker and Eagle resident Nate Picklo, the LOV Connection is 3.5 miles, and connects the Third Gulch and Abrams Creek trails. Momentum Trail Concepts owner Matt Thompson, along with numerous volunteers, put in the hard labor. Shipp says connectors like Picklo’s namesake trail are the top priority right now. Some of the businesses already involved include Alpine Bank, Marmot Electric, Streetswell, Mountain Peddler, Venture Sports, Momentum Trail Concepts, East West Destination Hospitality and Rocky Mountain General Contractors.